GRAND FORKS - To glimpse the colossal struggle for power between left and right in North Dakota, one only needs to attend the party’s conventions. 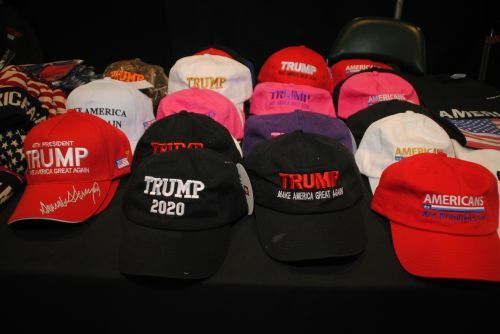 Both sides are desperate, one to restore, one to preserve control, but only one contrarian viewpoint was revealed during the North Dakota Republican Convention this weekend. Tiffany Abentroth. The rest were already firmly buckled into President Donald Trump’s bandwagon. Abentroth, a former Marine, did not receive the Republican Party’s endorsement to run for the state’s only Congressional seat, but she was the only person to talk about mending divisions instead of building walls. Abentroth slid a political elbow into Congressman Kevin Cramer’s side by saying she doesn’t support all of Trump’s agenda, but still lists herself as a conservative. She is privately funded, and does not represent any large corporate interests, she said. “Republican or Democrat, conservative or liberal, we are all Americans,” Abentroth said. Her race to the U.S. House of Representatives is not finished yet. A month after Democrats endorsed candidates running for state political seats, the Republican party held their own convention, affirming many candidates. After flip-flopping back and forth, and only after a political nudge by President Trump, Cramer will run against Senator Heidi Heitkamp for the U.S. Senate. The North Dakota GOP Convention gaveled in with a red coffee cup at 9 a.m. While Democrats opened their convention with Native drums, Republicans opened with prayer from the lead pastor of Hope Covenant Church, Paul Knight. At the Alerus Center’s entryway, purses and briefcases were searched before allowing entry; doughnuts appeased those who found the procedure intrusive. Praise for President Trump and his administration’s agenda accompanied nearly every acceptance speech, except for Abentroth’s. 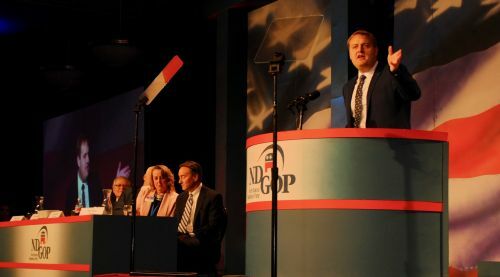 Boasting the largest super majority in 50 years, North Dakota Republicans believe the state is no longer being ignored in the nation’s capital and has achieved the recognition it needs from President Trump’s Administration. Republican talking points included addiction and the opioid crisis, Trump’s border wall, government technological upgrades, China targeting red states with trade tariffs, improving school systems, getting rid of Obamacare, bringing religion into politics, and continuing the fight against human trafficking, all while decreasing the budget. They praised the Tax Cuts and Jobs Act, saying that out of the 50 states, North Dakotans will benefit the most from lower taxes. Incumbent Attorney General Wayne K. Stenehjem, now the longest serving attorney general in North Dakota’s history, was endorsed to run a sixth term against challenger David Thompson, an attorney, who believes that Stenehjem, Cramer, and others are guilty of Class C felony bribery stemming in part from a 2011 underhanded deal with Continental Resources oil magnate Harold Hamm. Ryan Rauschenberger, 34, who was arrested for driving under the influence with an alcohol blood level exceeding twice the legal limit and pled guilty in October 2017, was given a third chance, as he was endorsed for North Dakota Tax Commissioner. Rauschenberger has been in recovery since 2014, and said he talks openly about his addiction, and that he is fit for office. “My ongoing recovery is important to me and I want to thank my friends and my family for their continued support,” Rauschenberger said. Former representative and current North Dakota Democratic-NPL chair Kylie Oversen will be campaigning against Rauschenberger, and she questioned Rauschenberger’s commitment in a press release. Brian Kroshus, former publisher of the Bismarck Tribune, was appointed to the Public Service Commission by Governor Burgum in 2017, and was endorsed to run for the state’s Public Service Commissioner. Kroshus’s job, as he sees it, is to continue developing affordable and reliable energy, help build a national energy plan, and safeguard changes the state is currently going through. Current North Dakota Secretary of State Al Jaeger was expected to receive the endorsement to run against Representative Joshua Boschee, a hard hitting Democrat who wants to “drain the prairie,” but late Saturday the Republican Party endorsed Mandan businessman Will Gardner. Five Republican candidates and one Libertarian vied for the state’s only Congressional seat. Tiffany Abentroth, state Senator Tom Campbell, a rancher from Grafton, a man in a support Trump t-shirt, Charles Tuttle, a coach and former oil field worker, Paul Schaffner, and state Senator Kelly Armstrong, an attorney who comes from an oil family with ties to Harold Hamm. Abentroth was also the only person to publicly address the recent impending trade war with China, and how tariffs on soybeans and pork will affect North Dakotans. “The impact of the federal debt crowds our domestic savings and dampens domestic growth. Farmers need protection from retaliatory tariffs,” Abentroth said. Charles Tuttle, who was in a Minot court in 2016 for supporting President Trump by placing temporary Trump signs on an “untraveled public right of way,” also made a bid for the state’s only Congressional seat. He wants to see UND’s Fighting Sioux make a comeback. He supports the Second Amendment, and he also made promises that he would fight for the Congressional seat until the end. Scott Hennan from AM 1100 "The Flag" nominated Tom Campbell, a person whom the Republican Party has been shunning since he first made his intentions known to run for the U.S. Senate, and then changed his mind to run for Congress. He dropped out of the Senate race and decided to run for Congress for party continuity, he said. 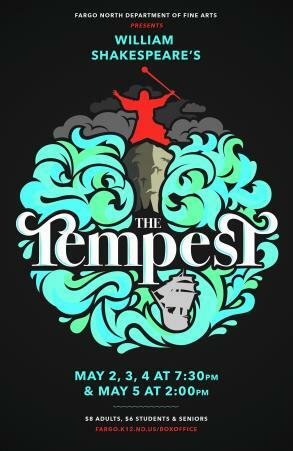 Rick Becker, of District seven, and a leader of the Republican’s Bastiat Caucus, a group of people who have been linked to the so-called “Alt-right,” and who also have heavy theocratic leanings, nominated state Senator Kelly Armstrong. 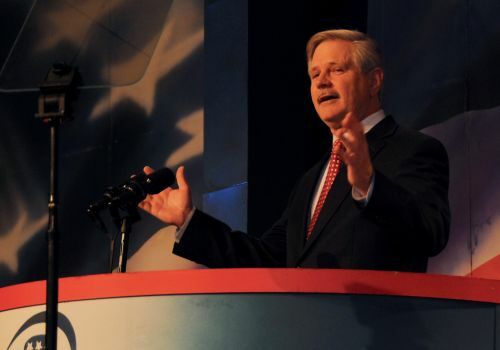 Under the tenants of individual liberty, personal responsibility, and limited government, North Dakota is heading toward a steadier conservative place, Becker said. Instead of focusing on financial profits like many long-term Republicans, Armstrong focuses on something more important, the principles of foundation of responsibility, charity, and fulfillment. 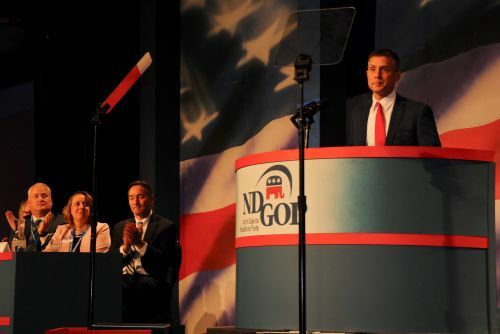 Armstrong confidently took the stage after receiving the North Dakota GOP endorsement, saying that the country works best when government is limited. He will be running against Democrat Mac Schneider, and attorney and former representative, for the U.S. House of Representatives. "We have seen those competing for the GOP nod for the U.S. House attempt to outdo each other in terms of who will be more loyal to the administration," Schneider said in a press release. "My highest loyalties, on the other hand, are to the people of North Dakota and to the United States Constitution." Armstrong promised to work for fair trade, limited agricultural legislation, defund Planned Parenthood and move funding to centers that do not perform abortions. He condemned the Dakota Access Pipeline protests, saying he is responsible in part for the ensuing legislative crackdown. 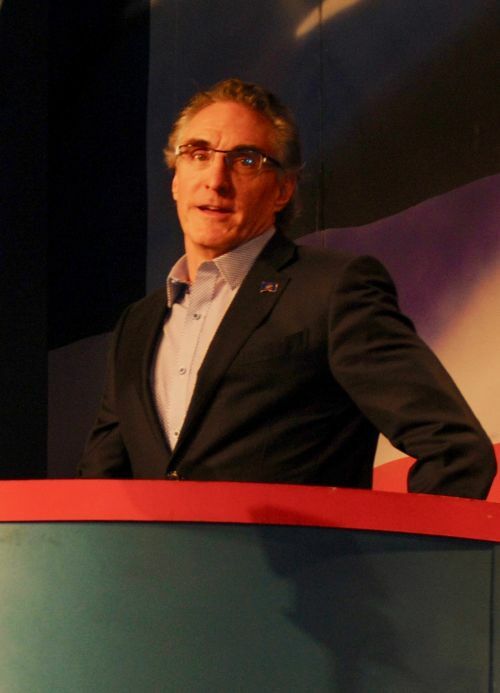 Burgum, Rauschenberger, and others praised the completion of the pipeline saying the project now offers the state tax payments exceeding $10 million per year. Taxes paid will be going in part toward education needs, Rauschenberger said. 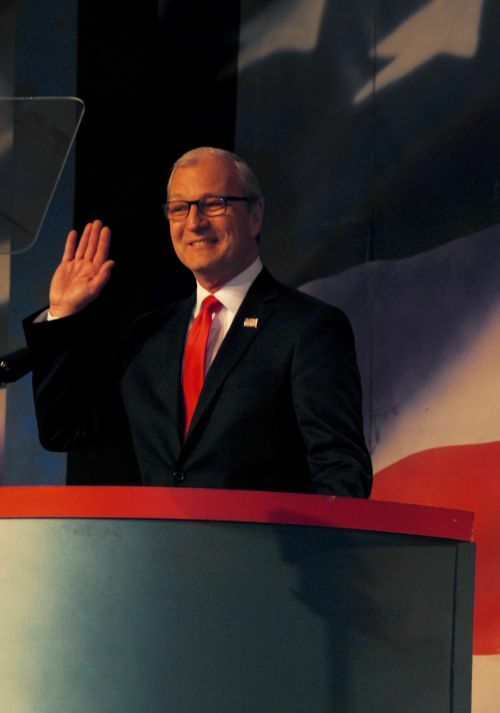 Before Cramer took the stage to accept the GOP’s endorsement, he was called an “unapologetically deep Christian man,” who is pro life, a self-assured politician with theocratic beliefs of bringing religion back into government. 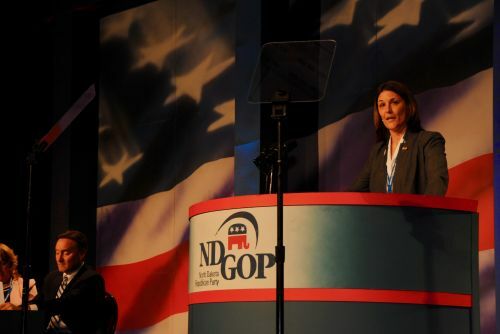 Despite being bolstered by more than 1,335 delegates checked in and registered, North Dakota Republicans appeared worried about the upcoming elections. “Ladies and gentlemen, America is back,” Cramer said. 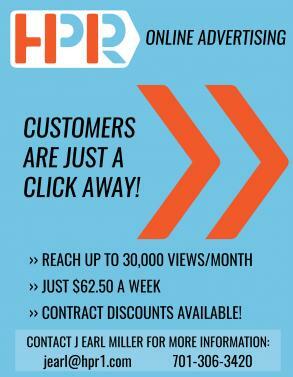 “But I don’t have to tell you how important this race is. Republicans have 51 seats in the Senate, Democrats have 49. It’s never been more true: one vote matters. Let’s make sure that one vote goes to a Republican who shares our values, and who puts North Dakota first. Cramer opposes sanctuary cities, wants to dismantle Obamacare, is against net neutrality, and has been widely criticized for being “welded to the hip” of President Trump. He was initially attracted to Trump because of his business savvy, he said. Cramer said since President Trump took office, he has lifted the oil export ban, a legislative measure his Democratic opponent, Heitkamp, was involved with from the beginning. He has helped pass significant tax cuts, has “drained the swamp” of duplicative legislation, and helped rebuild the military. Like Department of Interior Secretary Ryan Zinke, Cramer has been criticized for pocketing donations of up to $200,000 while paying his family more than $140,000. Zinke is being investigated for $600,000 in unreported donations to his PAC, and for vacations to Greece and Turkey while installing a $130,000 door, which is nearly the average price of a home in North Dakota. Heidi’s friends, he said, include former President Obama, U.S. Senator Chuck Schumer, and Hillary Clinton. “When Heitkamp votes against Trump’s policies, it just makes her wrong half of the time,” Cramer said. Cramer promised to build a government for the people and by the people, and he was met with wide applause, but he offered no methods on how he planned on doing anything different. A press release from Scott McNeil, executive director North Dakota Democratic-NPL, criticized Cramer’s speech. As the ND GOP Convention’s afternoon session began, two protesters entered, walked the breezeway before organizers notified police. 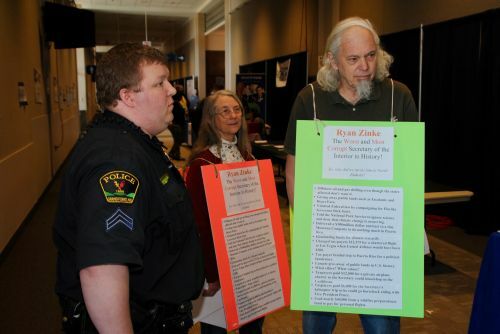 Dexter and Betsy Perkins, of Grand Forks, said they were protesting Department of Interior Secretary Ryan Zinke, calling him criminally corrupt. Zinke was the keynote speaker at the ND GOP Convention. The couple talked about allowing themselves to get arrested before eventually siding with Grand Forks Police Officer Justin O’Neil, who thanked them for not giving him a headache and leaving the premises. Zinke, form Montana, and a former Navy SEAL, started his speech by thanking North Dakota for voting Trump into the presidency. He added that historically, states like North Dakota, and Montana, don’t get the spotlight in elections, but this year is different. Zinke stressed issues such as increased border security, lower taxes, infrastructure, energy, and rebuilding parks. He is a proponent of strong borders, but also stated he is for properly regulated immigration policies. America is now producing 10.6 million barrels of oil a day, Zinke said, and is exporting natural gas for the first time in 60 years. Representing the party line, he wants America to become completely energy self sufficient. “I don’t want to send our troops overseas to fight for a commodity we have here,” Zinke said. 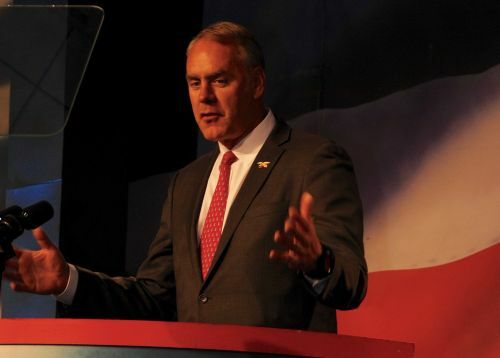 Although Republicans control the House, the Senate, and the presidency, Zinke said their political fight is far from over.